I am SO overjoyed that Spring has finally sprung and it's almost time for Spring Break! I know some schools have already had theirs, but LSU always plans ours the week before Easter, so it's a week full of fun and sun that ends with really nice family time - my favorite! This year, Myles and I are going to Amelia Island again. I cannot wait to be riding my bike to the beach every morning and having lobster rolls for lunch! Today, I've included the things I'll be packing, as well as a few of my spring favorites. If you need cute tops to pair with jeans, high waisted shorts, or super cute dresses, you'll love these picks! 1. Sunblock!! This is honestly the most important thing I ever pack. It's SO important to always protect your skin, especially in harsh summer sun, and I always go 35+. I also use this It Cosmetics foundation that has SPF 50 when I'm going out in the sun but want to look nice. It doesn't dry me out and stays on all day! I also bring tons of aloe vera because a sunburn is inevitable for me. I love a little straw fedora for shopping and bike riding, but a ball cap for beach time or an early morning workout. You get sun protection, but you also don't have to worry about salt water hair, two birds with one stone! 3. Plenty of cute dresses, tops, and shorts Some of my favorites that are 100% coming with me are linked below, but I linked even more, all under $100 here. Loving the light fabrics and nautical colors I've been seeing in new arrivals, plus high waisted seersucker shorts? Yes please! I am planning on packing dried cranberries, almonds, and some low fat cheese sticks. Easy to pack and you get a good mix of protein, fat, and a little sugar. 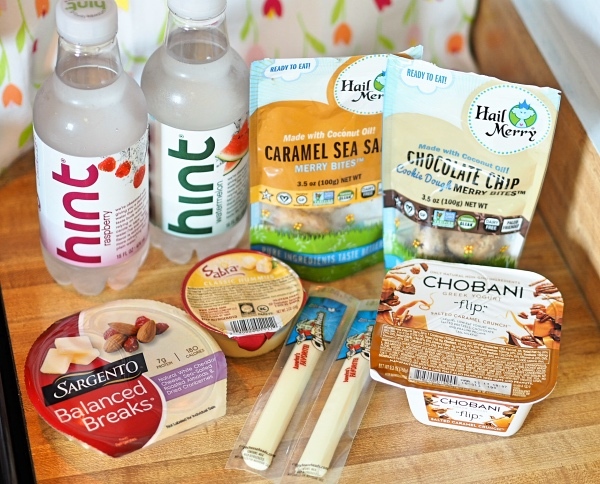 If you want more healthy snack options, I just did a post on the ones I'm loving last week! 5. Headphones and a book for the beach (recommendations here) I am always so tempted to either fall asleep or zone out on my phone when I have free time, but I'm planning on bringing only books to the beach this year, with the exception of a good playlist! I think vacation is such a good time to relax and refresh and getting lost in a good book is such a good way to do that. I linked a bunch above and can't wait to share which ones I pick up in April with y'all! 6. A few swimsuits, cute towels, and an easy to throw on coverup! I haven't bought any new suits this year, but I'm loving this scalloped one piece, this off the shoulder ruffle one, and this seersucker bikini! That bikini has been in my cart forever and I'm thinking I may have to scoop it up before we leave! A couple of weeks ago, I ran into an old crush while I was with Myles at a restaurant. It was such a weird experience, and one I keep thinking on because it felt so strange - like two separate lives merging together. It was nice to catch up, but it was like I was looking at two very different paths I could've taken, and while I wish nothing bad on the path I didn't take, it made me so, SO glad about the path I did take. When I was younger, I fell in "love" quite easily. Oftentimes without even talking to someone, because I liked the way they looked, who they were friends with, or even their last name. I would put so much effort into accidentally running into them, doing anything they needed, and going so far out of my way to be what I thought they wanted. That led to lots of "talking" but no real relationship and plenty of self-esteem issues that made me constantly second guess whether I was good enough/smart enough/pretty enough/etc.. I look back now and I can just imagine Jesus saying "Sarah, slow down, I know what I've got planned for you, and it's so much better than this." But there I was saying, "No, no, I've got this! We'd be perfect together because of XYZ." I had 3 criteria for people I would never date, and this should partly clue you into why things weren't working out. 1. I would never date anyone who wore cowboy boots. 2. I would never date anyone with a Cajun last name. (ex: Boudreaux) 3. I would never marry someone with a last name from M-Z because I wanted to be at the beginning of the alphabet. Can we just all laugh together? HA HA. Y'all, obviously I had other criteria, like funny, handsome, kind, hardworking, etc, but those were my absolute no's. 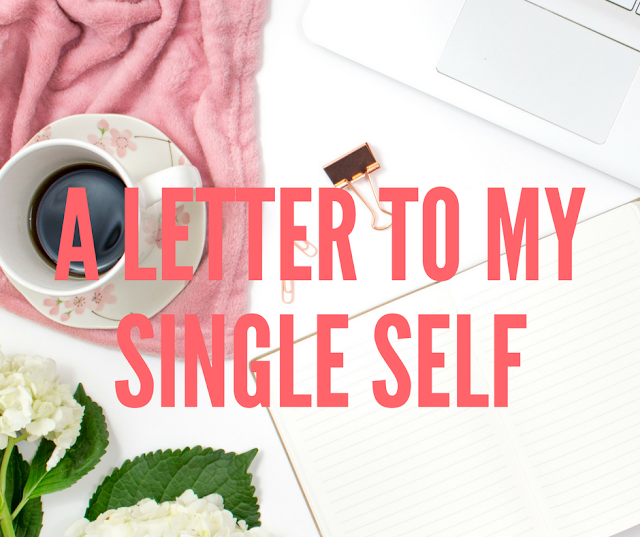 When I was on study abroad, I sort of let those things go and became so much more confident in who I am and realized that I was absolutely not going to settle, even if that meant being single forever. I put so much effort into building my friendships, and when I came home I started branching out into all of the things I'd always wanted to do but never made time for. I joined Student Government, went out more with my friends and put boys totally on the back burner. A few months before I met Myles, my mom and I were in a shop with bow-ties and I mentioned how I thought they'd be such a good gift for a boyfriend. My mom joked that I should get one and just save it for when I started dating someone and I literally laughed out loud like "yeah, when that happens!" None of this is to say that Myles is perfect, nor is our relationship. We have silly arguments like everyone else, and we work very hard to constantly listen to each other, grow together, and be the person we'd want to be in a relationship with. My life did not become perfect because I was in a relationship, and it never will. What I'm saying is that sometimes a relationship seems like it'll never happen. It feels like you're never going to meet someone who you can be yourself with or can talk about anything with. Now that I've been on both sides, I feel like I would never go back, but I can also say that if I knew what was coming, I'd be so much more confident in myself and my standards, knowing that someone who would meet and exceed them was coming, so there was no need to settle. I would have spent so much more time investing in myself and my friendships instead of hoping every time I went out that I would meet someone and feeling like it was a waste if I didn't. And I'd honestly rather wait a million years than settle for something that's just not right, just for the sake of not being single. Trust in the LORD with all your heart, and do not lean on your own understanding. In all your ways acknowledge him, and he will make straight your paths. Prov. 3:5&6 If I could tell my single self one thing it would be, "God knows what he is doing, you don't have to. And you don't have to control all of it either." As good as it is to be in a relationship, I will never get that single time back, and I wish I would have enjoyed it more, rather than wishing it away. There is a season for everything in life, so enjoy whatever season you're in and trust that God knows everything about you, your life, and his plan for it. He knows what you want, but also what's best for you, all in due time! When it comes to eating right and making sensible choices, snack time is the worst for me. I can eat healthy foods all day long and then come 3 o'clock on a long day or 9 o'clock on the weekend and man, all I want is cookie dough and an ice cold Coke. 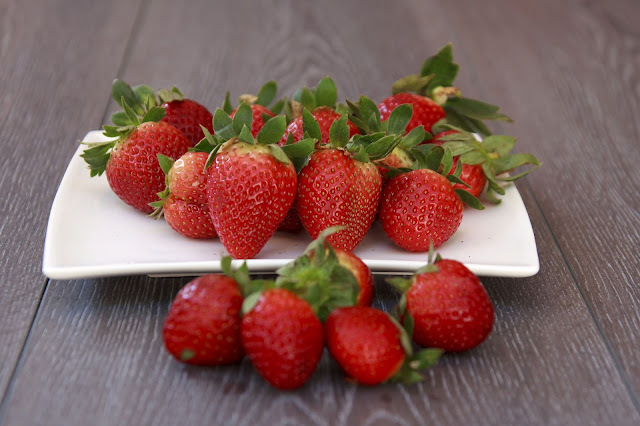 Because I know this about myself, I've been trying to only stock my fridge with things that are better calorie and macro wise than those sugary things, but still are a good, filling snack or a sweet treat! If you're overwhelmed with options and aren't sure what to keep on hand snack wise, this one's for you! As you can see, I try to keep a good mix of savory and sweet snacks. When I need a little pick me up before the gym or want something small to supplement a protein shake for lunch, I grab one of these. I keep 2oz hummus singles, low fat cheese sticks, and Sargento balanced breaks with almonds, cranberries, and cheese on hand for just those occasions! 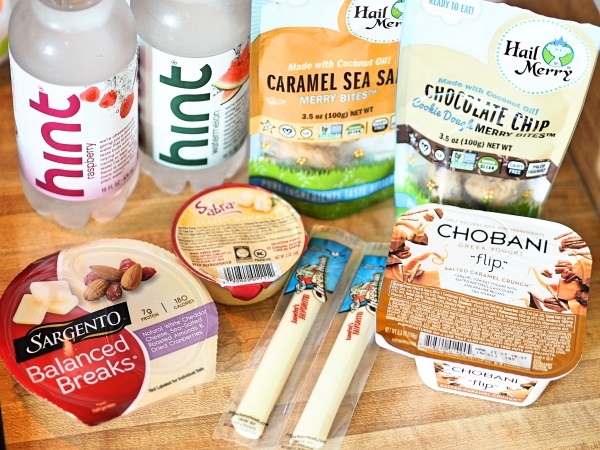 The hummus is great for a snack right before or after a meal because it's light but filling, and the Sargento snack breaks are great for a but of sugar and healthy fat before the gym. I also have a huge bag of roasted almonds that I portion out into mini ziplocs because they're easy to throw in my purse and don't have to be refrigerated. I make sure to have them for long shopping trips, days at work, or when I am going straight out after the gym. If I'm prepared with a healthy snack, I won't reach for (or pay for) something unhealthy! For those times that I'm craving something sweet but don't want to blow all of my hard work on ice cream, I turn to this bunch! I love having a Chobani flip after dinner as a treat, but don't eat these everyday as they are quite sugary. However, the greek yogurt does fill me up and satisfy my cravings! During the day, I really enjoy having a bite of two from the Hail Merry bites collection. I found these at Whole Foods and they taste like cookie dough but are so much more filling. They're all organic, and while they have sugar, they also have other good ingredients that give you energy and make you feel more full. My favorite are the salted caramel and I highly recommend them if you can find them! I found a recipe on Pinterest for some very similar no-cook protein balls and I'll be making those very soon! Last but not least, the thing that has surprised me most, I LOVE flavored Hint water. I don't like carbonated water or any flavored waters usually as I find that flavor too strong and sweet. Hint is so subtle and had no added sugars or calories, which I love, but I haven't missed Coke at all since I started drinking it. To me, it's just as refreshing as plain water, with just a hint of sweetness to keep me from reaching for soda! If you're trying to eat healthier, lose weight, or just get in shape for your health, I hope this helps! Tuesday's post was on clean eating and how simple it is to eat clean, so check that out for more inspiration and information! Hi friends! 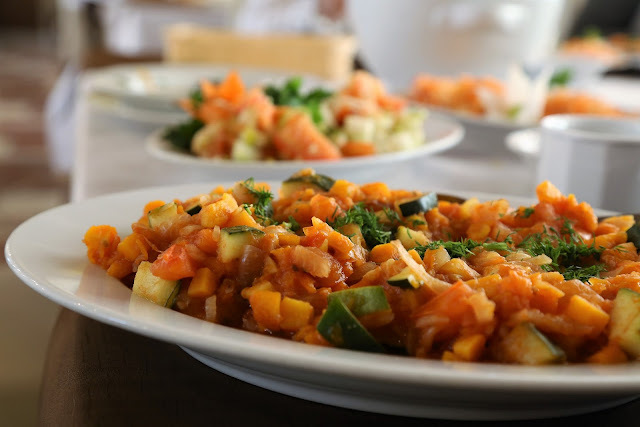 If you've been here before, you'll know that I've really been trying to work out and eat better in order to get healthier - that college frozen food diet doesn't really do much good for your organs! Monica reached out to me to do a guest post on clean eating and I know I enjoyed it, so I thought you guys would too. It can sometimes be really overwhelming to totally overhaul your diet and exercise routine, so easy to read and implement articles like these are my favorite because you can take it one step at a time! Whether you're wanting to get in better shape for the summer or just wanting to start better habits in general, I think you'll love today's guest post! Now, even if you’re not a big fan of trendy diets, you’ve probably heard about the concept of “Clean Eating” in the past couple of months. Basically, it’s a concept that puts an emphasis on healthy, unprocessed foods and while the buzzword is relatively new, the principles of this diet are older than you probably think. As you’ll see, Clean Eating is a relatively simple concept that doesn’t require any major lifestyle changes, like some other diets out there. It doesn’t revolve around the idea that you should consume more or less of specific foods, the idea is more about being aware where your food comes from. So now you’re probably wondering, what are its principles? Well, they are quite similar to recommendations made by some more famous health organizations. In short, this is not exactly a diet; it’s actually a flexible lifestyle that can fit basically any routine. The concept dates back to 1960s and the so called “Health Food Movement” that rejected processed and genetically modified foods, for the sake of societal values. After a decade or so, the diet found its way to the gyms all across the world, where it became extremely popular among both fitness enthusiast and professional body builders. A few years ago, the diet made the jump to the mainstream and started inspiring a new generation of people. Over the years, the concept slowly developed and today, it has five rules. Even though it probably won’t be possible all the time, you should try to increase your consumption of brown rice, quinoa and other whole grains as much as you can. Furthermore, legumes and beans are probably as important as whole grains. And if you’re wondering about clean sugars, you simply should increase your intake of honey and maple syrup. So what actually are processed foods? Well, just think of it this way – processed foods are essentially those that can be found in packages like boxes, bags and cans. Now, if you don’t know where to find fresh foods, or don’t have the time to go to your local market, don’t worry, because there are many meal delivery services that send fresh supplies to your door on a weekly basis. A lot of people include fats and carbs into most meals they eat every day, but our meals often lack protein – especially in the morning. It's important to understand that protein works as a muscle builder that curbs your appetite, and naturally, if you pack every meal with protein, you’ll feel more full throughout the day. Just make sure to find what foods are full of protein so you could space them out properly. While most of us feel nervous without our daily dose of sugar, cutting it out from your diet is not as difficult as you might think. For instance, if you simply cut out the processed foods from your diet, you’ll also cut a lot of sugar and salt, because they are mostly responsible for your high sugar and salt intake. Clean and natural foods are of course, pretty low in these ingredients, and the more you eat clean foods the less you'll crave the bad stuff. So how many meals do you typically eat? I bet it’s not more than three. But if you embrace Clean Eating, you need to start eating at least five meals per day (although there’s nothing wrong with seven meals. This includes three main meals and two to four snacks, which prevent you from overeating and help you keep your blood sugar level optimal so you can stay energized from the early morning hours to the time you go to bed late at night. Unlike many “trendy diets” this particular diet doesn’t include any strict guidelines about the amount of food you should consume, because the aim of Clean Eating is to help you learn to rely on your instincts and cues from your body to know when you’re full. The bottom line is – you need to eat good foods when you’re hungry and stop eating when you start to feel full and satisfied and not over-stuffed. Simply pick healthy snacks, serve sensible portion sizes of well balanced meals and you’ll feel healthier than ever, plus, you’ll lose a couple of extra pounds in the process. Being a writer and fashion designer is a dream come true for Monica Nichols and since she was a child, she knew her artistic tendencies will determine her life. She is a beloved writer of www.diet.st she is 32 and currently living in Omaha, Nebraska. Monica likes to spend her time doing yoga and going to live jazz gigs whenever the opportunity arises. That's all guys! I hope you enjoyed this and found it as helpful as I did! I'll be back on Thursday with a post on the healthy snacks I make sure to always have on hand. See y'all then! Good morning friends! Is it just me or has this week after Daylight Savings dragged on and on? I think it's probably because I've been eagerly awaiting a package that's coming on Friday and so I've been counting down the days all week. 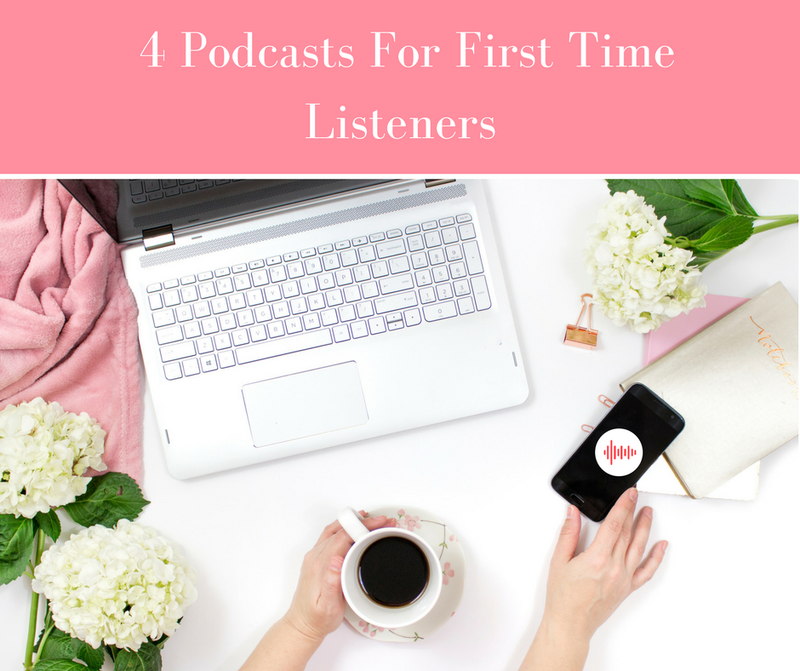 Today, I thought I'd talk to you about my favorite podcasts. My current reading list post seemed to be one you guys really liked, so I thought you might enjoy getting a few podcast sumaries/recommendations! Until recently, I only listened to podcasts on long car trips, but there are SO many and I actually prefer to listen to them over music when I'm in my car or at the gym. Plus, podcasts are free, so why not? Good morning friends! I swear my life has felt like whirlwind since Christmas and I can't believe it's already mid-March. However, in all the craziness, I've managed to find some really cool "new to me" companies and products, plus an app I think everyone should have on their phone! If you like free food and classic style, I think you're gonna love today's post! 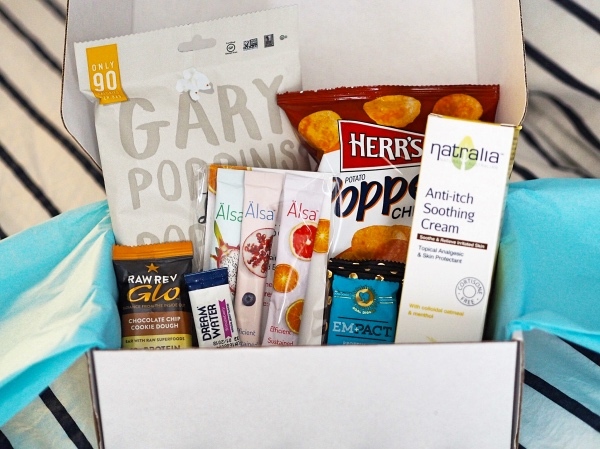 Daily Goodie Box // This company reached out to me in January and asked if they could send me a box to try, and to be honest, I thought there was going to be some sort of catch. Basically, you visit the website, create an account, and then they send you a free goodie box with lots of things to try. The more you review them and send in feedback, the more you receive. Now that I've gotten a box, I totally recommend that everyone sign up because they things they send are actually really great products and there is 100% no catch. They don't ask for credit card info and the box arrives at your door super quickly! I've participated in other subscription boxes and wasn't very pleased with what I received. Lots of times I get things I have no interest in, are not relevant to my daily life, or don't fit me at all (aka 10 shades too dark foundation). Everything in this box look yummy (healthy too!) and went with the theme of "good for you" snacks. All except for the anti-itch cream! Anyway, I totally recommend you check it out! Especially those of you who are college kids and wouldn't mind a few free snacks here and there! Genius Scan // Y'ALL, this is genius, hence the name. I have to scan papers all of the time for school or work and I'm not always near a printer and then fax or scanner. This app scans documents in singles or in groups using your phone camera and then you can email them to yourself or whoever you need to. It crops it perfectly so you don't get any background and the email file looks exactly like you used a real scanner. I can't believe I never looked up an app for this before, but it makes total sense with how good iPhone cameras are these days that they can do this. I think everyone should have it on their phone just in case! Everlane // I found this company through a fellow blogger who posted about this silk shirt. I loved how it looked on her and so I ended up ordering one for me, as well as this "100% human" box cut tee. I love simple, clean basics and Everlane has TONS. If you just want well made lounge wear, they've got it. If you want clean cut, classic work wear, they've got that too. They are also completely transparent about cost and pricing, so you know exactly what you're paying for. LOVE! Abbott Lyon // I have been looking for a nice, grown up watch for a while now. I got one in high school that was covered in fake jewels and huge on my wrist and I quickly outgrew it. Since I'm starting law school soon, I wanted one that would go with everything and grow with me and I found the perfect company in Abbott Lyon. 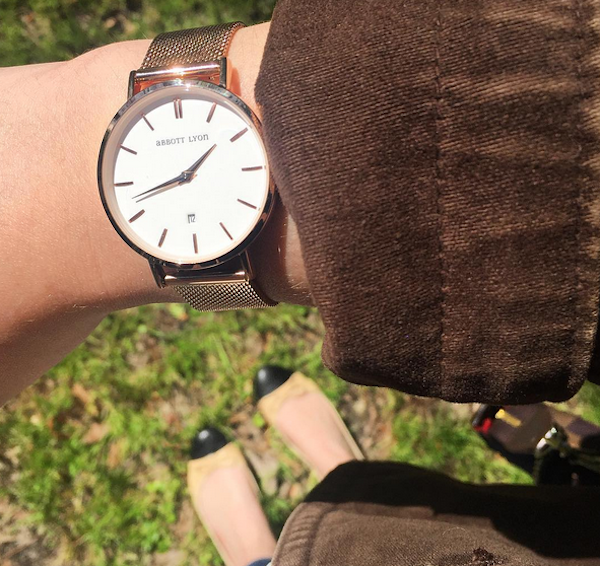 The watches are elegant but stylish and I love their simplicity. I find that they fairly priced, well made, and shop quickly, especially since they're made it England. I have the Rose Gold Kensington 34 and it arrived at my doorstep only 4 days after I ordered it, including a Sunday! And that's it folks! I hope y'all enjoyed hearing about some of my new finds and some of these are new to you too! See you Thursday! Good morning friends, and happy Thursday! It's almost TGIF time and man, am I excited! Myles and I are running in our first 5k this weekend and our families are coming in for brunch after to celebrate, so even if it rains it should be a great time! In other news though, I'm back today with my updated skincare routine. I haven't done one of these in a while, and lots of things have changed, so I wanted to share what I'm loving lately. 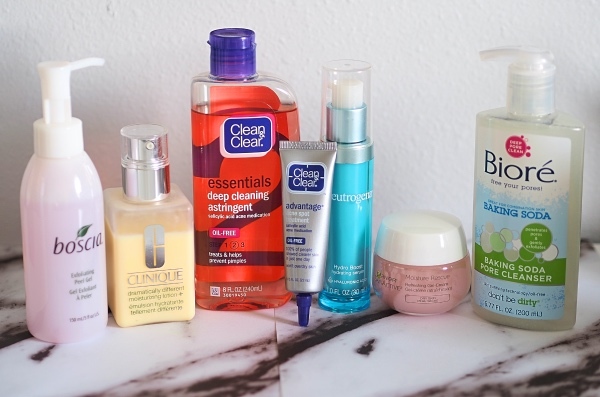 I have dry, sensitive skin, so it's quite hard for me to find things that can deal with break outs but not dry me out. I also have trouble exfoliating, but it's the number one thing you can do to keep healthy, glowing, young looking skin, and I think I've finally found the perfect skincare routine for me! Good morning friends, and happy March! Seems like it's been so long since we last talked, but this weekend has been so refreshing! I pushed for my quickest run in preparation for my first 5k this weekend(!!) and I took my first barre class! Today, I'm back with some of my favorite spring pieces under $100! Of course I love these shoes for spring as well, but they didn't make today's budget! There are so many gorgeous new arrivals appearing day after day, and no need to break the bank to refresh your wardrobe for the warm temps ahead/ I've linked up tons of cute hats, sandals, dresses, skirts, and tops, plus the cutest pair of high waisted tweed shorts! *heart eyes times a million* The standouts for me are these tweed shorts, chambray slip ons, white denim skirt, and the cutest pom pom sandals ever, but really I'm loving all of the new arrivals I'm seeing these days! I'm also planning to pick up these Born flats in blush, because I've heard that they are super comfortable while being totally adorable, and I already got this white cotton dress, because it'll be perfect for Easter and hot summer nights at the beach! I own this trumpet sleeved top as well as this bow sleeve beauty from Madewell already and have worn them 3 weekends in a row, so I highly recommend! Happy shopping! I'll see you here on Thursday with an updated skincare routine!